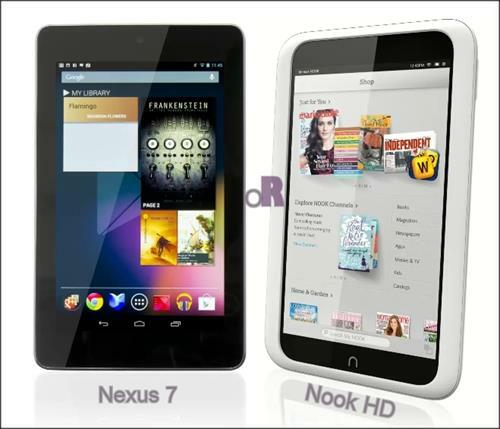 LG Asus Google Nexus 7 v/s Barnes and Noble Nook HD - Which is better? Nexus 7 and Nook HD are the main subjects of present talk. Do you want to know which is better tablet? LG Asus Google Nexus 7 or Barnes and Noble Nook HD? Then, go through this article and get informed with every aspect of the tablets and their complete comparison and review. Barnes and Noble Nook, also known as Barnes & Noble Nook Tablet 16 GB is a touch-screen e-book reader tablet, with perfect color match. The tablet is of half the price of an Apple iPad, offering almost every function, which any normal tablet can have. In addition to this, Nook HD provides streaming media services. The only con offered by Nook HD tablet is that it lacks flexibility of a featured tablet. In simple words, Nook HD is one of the best small tablets for books and magazine reading but lacks multimedia facility. Talking about Nexus 7, it is the world's lightest 7" tablet by Asus powered by Google. It offers a beautiful and responsive touch screen and being most light, it is very comfortable to hold. With best price, LG Asus Google Nexus 7 is a big steal. Both Nook and Nexus 7 are tablets and have the same form factor i.e. Candybar. Barnes and Noble Hook is run by Android v2.3 GingerBread OS, where as Google Nexus 7 is run by Android v4.1 Jelly Bean OS, which is faster, smoother and better than that of Nook. B&G Nook weighs 14.10 oz (400 g) which is 60 g more than that of the weight of Nexus 7. Talking about dimensions, Nexus 7 is a bit slow with 7.81 x 4.72 x 0.41 inches (198.5 x 120 x 10.45 mm) where as Nook holds a dimension around 8.10 x 5.00 x 0.48 inches, equal to 206 x 127 x 12 mm. While this aspect is taken under concentration, Nexus 7 is better than Barnes and Noble Nook, having the latest OS version and less weight. Google Nexus 7 is currently the world's lightest 7 inch tablet. Both tablets live up to their names with 7 inch IPS LCD displays. The only things which make a strong contrast between them in this aspect are resolution and pixel density. Barnes and Noble Nook HD has a 7" IPS Capacitive LCD Multi-touch screen display with a resolution of 1024 x 600 pixels at 170 ppi pixel density where as Asus Nexus 7 features the same screen but with a resolution of 1280 x 800 pixels at 216 ppi pixel density. In addition, these two tablets have color depth around 16 M (16 777 216). However, Nexus 7 has light sensor, proximity sensor and Scratch-resistant glass, unlike Nook HD. As discussed above, it is clear that Google Nexus 7 is far better than Barnes and Noble Nook HD, having higher resolution and pixel density. This aspect is a contrast factor between Barnes and Noble Nook HD and LG Google Nexus 7. Nook HD is powered by 1 GHz TI OMAP4 dual-core processor, while Nexus 7 is NVIDIA 1.2 GHz Tegra 3 T30L quad-core processor. Moreover, Nexus 7 has a ULP GeForce Graphics processor @ 416MHz, which is very effective than that of Nook HD. Talking about system memory and storage, both tablets support 1 GB of RAM and 16 GB on-board memory. However, Google Nexus 7 is also available with 8 GB memory variant model and Nook HD supports a storage expansion up to 32 GB via microSD or microSDHC card. After pondering on the above contrast, it is very clear that Google Nexus 7 has better performance rate than Barnes and Nook HD. Google Nexus 7 equips a Li-Polymer 4325 mAh battery, which is very powerful than what Nook HD equips. Both devices hold battery life up to 9 hours on video playback. Moreover, both have non-user replaceable batteries. Both, Nook HD and Nexus 7 have mastery over this aspect. However, Google Nexus 7 has Li-Polymer battery which is more powerful and long lasting than Li-Ion ones. There is nothing to say regarding this aspect. Nexus 7 has a 1.2 MP front camera where as Nook HD is non-camera tablet. Actually, Barnes and Noble Nook HD is developed for ebook reading and there doesn't lie any need of having a camera (rear or secondary). Over this aspect, winner is Google Nexus 7. Barnes and Noble Nook HD tablet is very poor in this aspect. It only supports 802.11 b,g,n Wi-Fi, HMDI and 3.5 mm headphones connector. Whereas Nexus 7 tablet supports Bluetooth 3.0, 802.11 a,b,g,n Wi-Fi, USB 2.0, microUSB charging connector, USB Host and 3.5 mm headphone jack. Moreover, it features Computer sync, OTA sync and NFC. LG Nexus 7 has a 100% mastery over this aspect than that of Nook HD. Almost both the tablets have same browsing features. The browser of Nook HD features HTML and Flash, where as the browser of Nexus 7 features HTML and HTML5. Nexus 7, however, having HTML5 feature that make it very relevant to today's technology and advancements. Moreover, Barnes and Noble Hook smart tablet has only one built-in online services support ie Facebook and while considering that of Nexus 7, it supports YouTube and Picasa by default. Barnes and Noble Hook HD tablet was announced on 07 Noveber 2011 while Asus Google Nexus 7 tablet was officially announced on 27 June 2012. Nook HD and Nexus 7 have been priced between Rs 10,500 and Rs 15,999 in India. One can buy Nook HD from Amazon at a price tag of $ 140.00 and Nexus 7 from Amazon, Quill, PCconnection, Adorama and Datavision at a price tag of $ 209.99, $ 199.00, $ 249.00, $ 249.99 and $ 279.99 respectively. After having a keen look over the above made comparison between Barnes and Noble Hook HD and LG Asus Google Nexus 7 smart tablet, the result is before you! Nook HD is not at par while as Nexus 7 seems to have mastery over all the aspects including design, display, hardware, battery, camera and so on. It is also clear that Noble Nook tablet is mainly developed for ebook reading and reader. Talking about Nexus 7, it is very high-tech and high-end smart tablet made for entertainment and Google Play. So, if you are fond of reading ebook, Barnes and Noble Color HD 7-inch tablet is fit for you and if you are an entertainment/gaming enthusiast, then Asus nexus 7 is the way you go. The comparison is over. Now, we know the winner and its winning reasons. Nexus 7 is one of the best choices to be made. If you aren't fully satisfied with the specs of Nexus 7, then go through its jaw dropping hands on review. Start saving your money today and get your hands on Google Nexus 7 tablet.